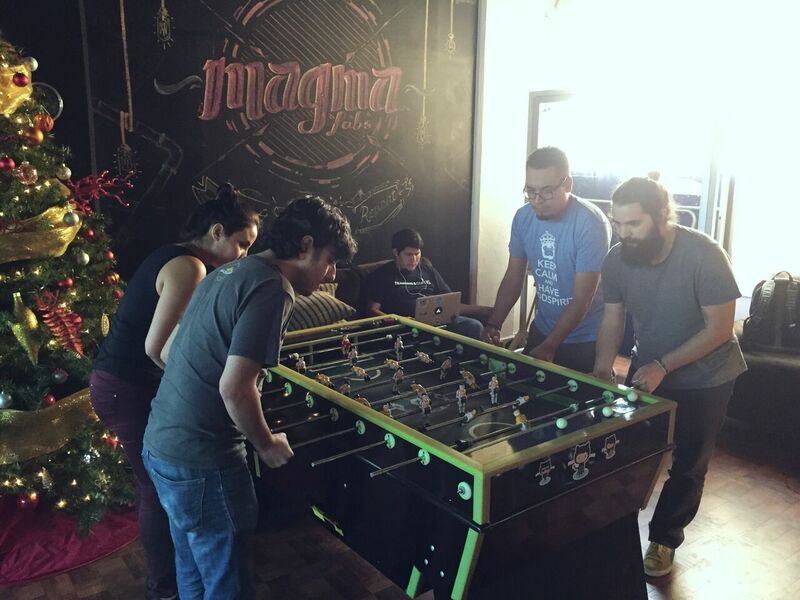 Hi, I’m Gustavo Colorado, Designer at MagmaLabs. I’ve been working in the Information Technology industry since July 15 of 2015, and I’m going to share my experience with you. This is my first blog post …so please don’t be rude guys. When I was in college, I worked at a Creative studio as a Graphic Designer, and with a lot of hard work, I became a Creative Master. I didn’t know anything about IT companies at that time, but when Hugo Hernández “Don Chambitas” told me about it, I immediately made a weird face because I couldn’t believe that they existed in Colima. These companies really care about their personal by making them feel incredible in their jobs. How? With lots of benefits! 😀 Good payments, possibility to travel, free breakfast at morning, relaxed workspace, conferences, etc. It’s really awesome! Chambitas invited me to send my Portfolio to MagmaLabs, an expert UX/UI Design, Ecommerce and Software Development Consultancy with presence in the United States and Mexico. They were looking for a Trainee Graphic Designer. I sent it one week later, because I didn’t know anything about MagmaLabs, so I didn’t pay too much attention. One week later Chambitas told me that I qualified to have an interview with MagmaLabs. I didn’t investigate more about the company, so I wasn’t very enthusiastic about the news Before I had the interview, they challenged me with the redesign of one website called “Judy Dolls”. They gave me one week to do it, so I looked for advice with people what worked on web design, to get more information and do my own redesign. Two weeks later Chambitas called me and told me the good news, they wanted me to go to their office. When I arrived at the office, I was surprised with their installations. They were incredible, with a lot of things like a Futbolito relaxing areas, puffs and with an amazing and complete coffee bar with fruit and popcorn.It was awesome for me because I had been dreaming with a workplace like that for a long time. Since I started working at MagmaLabs, I’ve been learning every day about topics like web design, UX/UI, communities, networking and the IT CULTURE. This has been the best part because I always thought that the IT Industry was boring but now that I work here, I was completely wrong. Most of the IT companies are really relaxed with the work schedule They have a good workflow and sense for the people that are part of the team. I haven’t found yet a bad thing of it, so I’m focused on enjoying the good things and benefits that I have now! I totally recommend working at these companies especially if you are a Designer because in Colima is very difficult to find a good place to work and with all of the IT benefits. However, consider that you need to improve your skills in order to qualify for a position in these companies. You can also get tips and advice from front-end developers, there are communities in Colima like “Thinking Couch” (Web designers meetups) and “Web Dev Talks” (Developers meetups where you can find new people that it’s on the IT world and can introduce you in this amazing world! And of course you can contact me at gustavo.colorado@magmalabs.io for more information, I’d be happy to help!